Home > 19th century > Why no flowers for Nellie, orchid-painter extraordinaire? It’s a shame that orchid-lovers cannot leave a bouquet on the precise spot where rests Lambeth’s peerless watercolourist and illustrator Nellie Roberts. OdontoglossumGoldcrest First Class Certificate RHS12th Jun. 1923 exhibited by Armstrong & Brown and painted by Nellie Roberts. Flowers could and should be be left at Nellie’s grave in gratitude for all the beauty that this watercolorist’s brush captured during her 56-year career as an illustrator for the Royal Horticultural Society, our near-neighbour just across the Thames in Westminster. If only. Nellie died at the age of 86, unmarried, on Easter Sunday, 29 March 1959, and she rests in Grave No 262 D3 of Lambeth Cemetery in Blackshaw Road, Tooting. But there is no headstone bearing Nellie’s name because hers is a ‘general’ or public grave. Quite common at the time, a general grave was a cheaper alternative to the purchased variety, and as many as 20 people might be interred in the plot. Odontioda Charlesworthii ‘Theodora’. First Class Certificate RHS 3 May 1910, exhibited by Lionel de Barri Crawshay and painted by Nellie Roberts. Nellie, who left behind over 4,500 studies of orchids, was born, lived, worked and died in Brixton. She was 87 at her death in 1959 and is buried in Lambeth Cemetery, Blackshaw Road, Tooting, but nobody can say exactly where. There is just one known portrait of her, which appeared in Louis M. Boyle’s Out West: Growing Cymbidium Orchids and Other Flowers (1952). 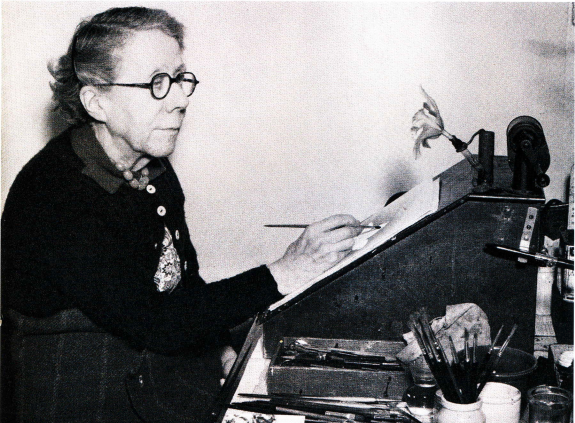 Nellie Roberts paints a Cattleya alliance flower at home at 72 Loughborough Road, Brixton. From Louis M. Boyle’s Out West: Growing Cymbidium Orchids and Other Flowers. Born in Brixton in 1872, the daughter of a watchmaker, Nellie lived and worked in a room above the family shop at 72 Loughborough Road. ‘Very shy & retiring,’ she painted away in a ‘small, neat but rather cold room’, according to The Orchid Review. Nellie came to suffer so badly from rheumatoid arthritis and chilblains that she had to wear mittens. Nonetheless, what beauty she let behind with those thousands of orchid paintings. Promenaea Crawshayanum. Award of Merit RHS 23rd May 1905, exhibited by Lionel de Barri Crawshay and painted by Nellie Roberts. When Nellie was in her teens, ‘orchid mania’ set in, and the RHS Orchid Committee was swamped by plant entries. This was before the days of colour photography, yet the Society needed life-sized portraits of the award-winning blooms. 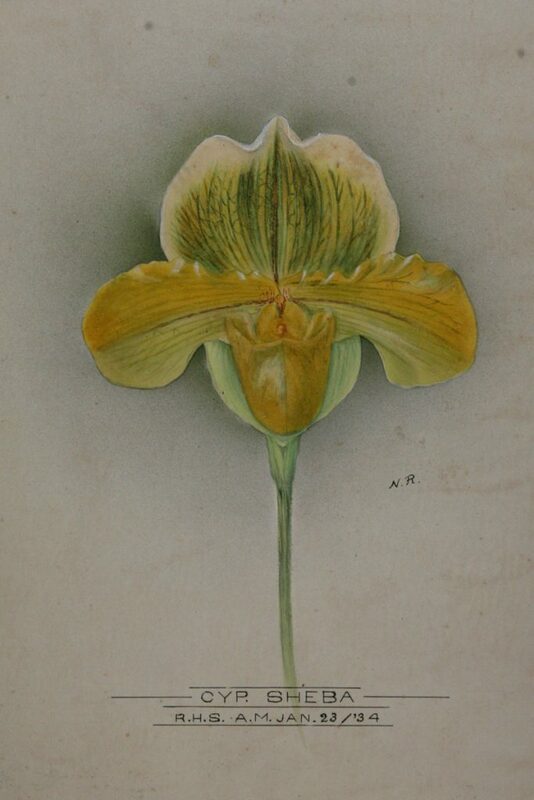 The young Nellie used to show flower-paintings in the family’s shop window, and they were noticed at a time when the Orchid Committee had decided to hire its own artist. She was taken on in 1897, subject to a six-month trial, and stayed for 56 years, bowing out in 1953, Coronation Year. PaphiopedilumSheba. Award of Merit RHS awarded 23rd January 1934, owned by Frederick Hanbury and painted by Nellie Roberts. Nellie has a hybrid orchid named after her, the scented Cattleya Nellie Roberts (registered 1953), but never got to paint it because it was not an award-winner. She did, however, paint a cultivar, Odontoglossum Opheron ‘Nelly Roberts’ (‘Nelly’ is the spelling of the painter’s first name on her birth certificate), which was an RHS award-winner of 1952. If Nellie Roberts did not create beauty (although who is to say she didn’t? ), then she certainly captured it so it could be shared around. Let us know if you have any more information on Nellie Roberts. We will pass it on to the RHS Orchid Committee who welcome any additional information. Email info@vauxhallhistory.org. 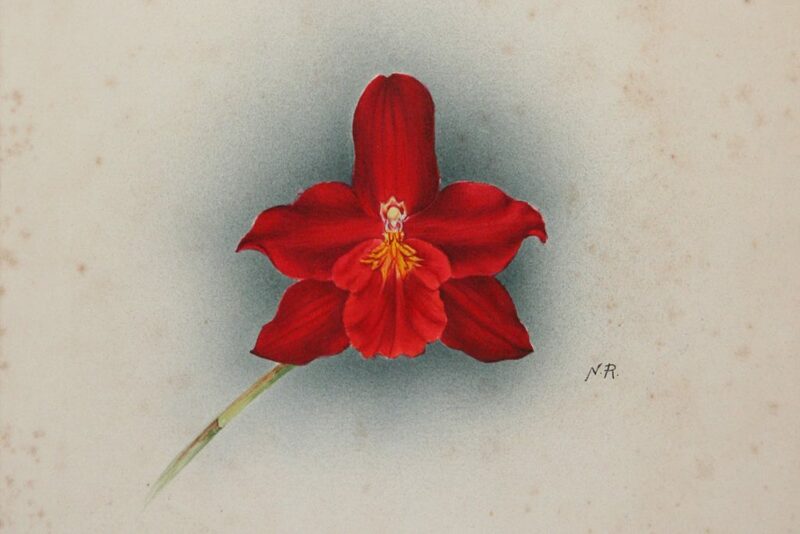 Vauxhall History wishes to thank Clare Hermans and the RHS Orchid Committee for their help with our article and permission to reproduce Nellie Roberts’ paintings. In January 1897 Miss Nellie Roberts, aged 24, was appointed the Orchid Committee’s first Botanical Artist tasked with painting its awards.1. She would continue in this role for another 56 years, completing over 4,500 paintings. This period spanned the end of ‘Orchid Mania’ to the mid-20th century, by which time many of the great orchid collections had been dispersed. Odontoglossum Smithii First Class Certificate RHS 5th Dec 1905 exhibited by Messrs. Charlesworth and painted by Nellie Roberts. Nellie’s paintings helped reduce controversy created by the early duplication of names for the man-made hybrids, provided a permanent record and were an aide-memoire especially in the 19th century when hundreds of awards were given annually. 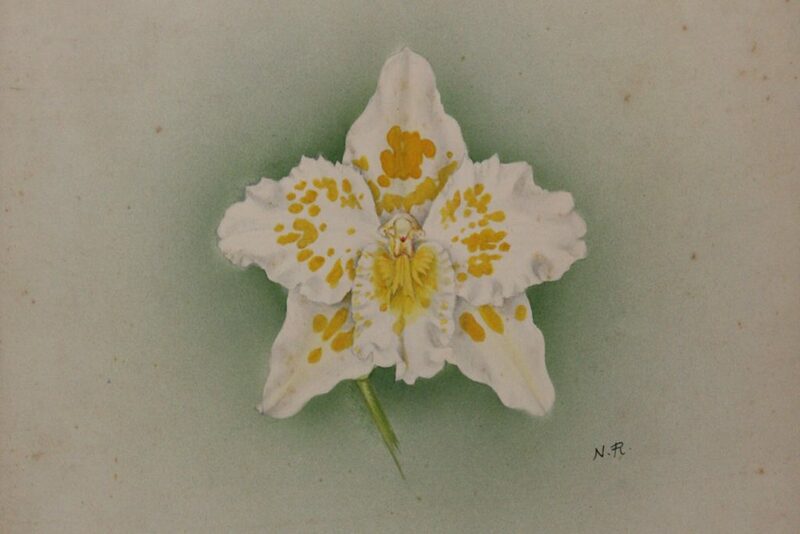 Her work was not exclusive to the Committee; she made copies for the owners as well as painting some of the awards of the North of England Orchid Society. Given her prodigious output, it is not surprising she became widely known and was held in high esteem by the orchid fraternity. 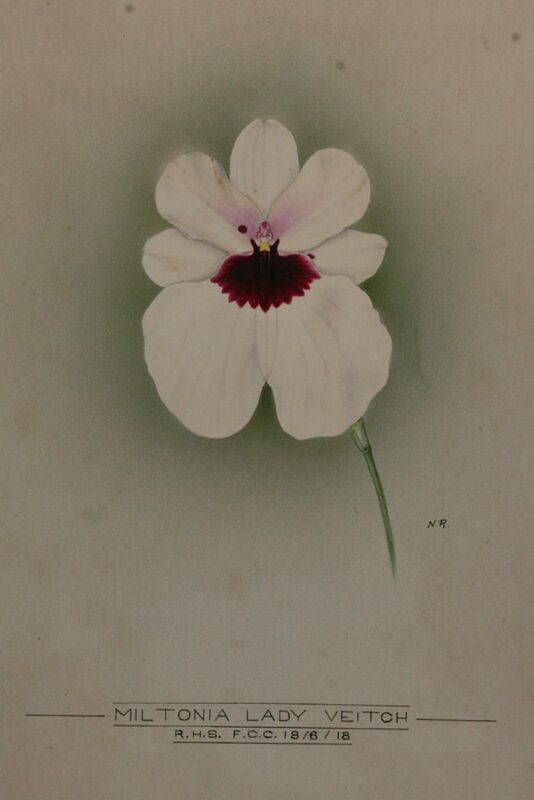 Her paintings were natural size, frontal view and using background colour for emphasis, especially for white flowers. The same style, with only minimal variation has been continued by the eight artists who succeeded her, including the current post-holder Deborah Lambkin; colour photography has not been able to replace their accuracy. Miltonia Lady Veitch. First Class Certificate RHS 18th June 1918, exhibited by Armstrong & Brown and painted by Nellie Roberts. The collection of award paintings now in the RHS Lindley Library is an invaluable resource for the Committee and remains a unique and remarkable documentation of the awards. The paintings are still used in meetings when a submission is compared to previous awards given to the same species or hybrid. 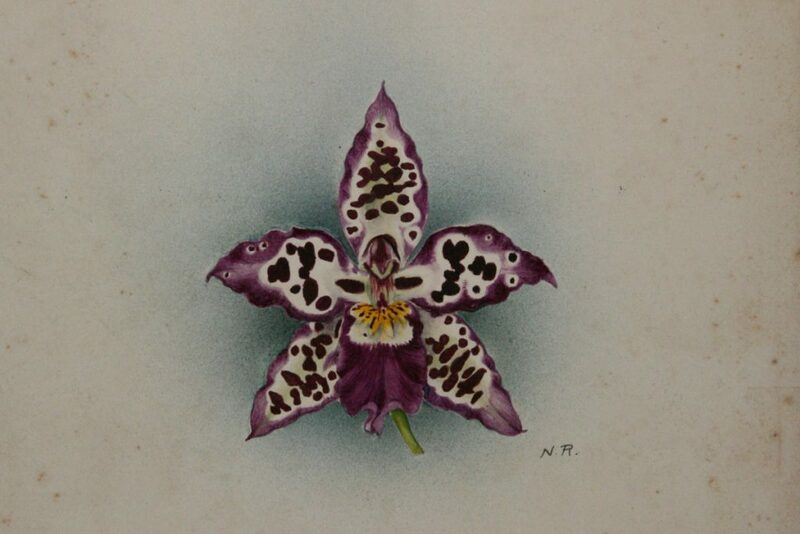 Furthermore, they add to the rich history of orchids, their hybrids and their illustration. 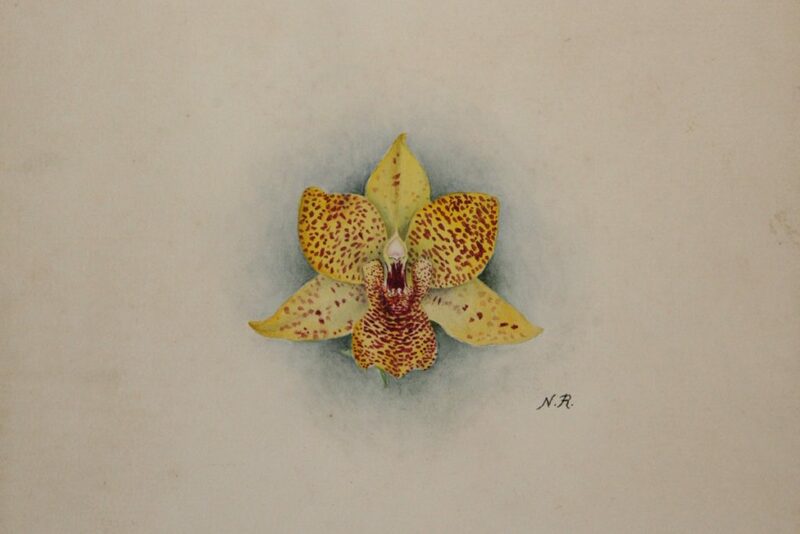 Nellie Roberts’ work comprises just less than two thirds of the total and is known throughout the orchid world. This is a remarkable achievement for the almost certainly self-taught daughter of a clock repairer from Brixton. The Orchid Committee awards are written up in the RHS journal The Orchid Review and can also be seen on Twitter. Read more about Nellie Roberts in Thomas Allen Oder’s article about her in The Orchid Review (March 2009). Although christened Nelly, Nellie was used extensively in contemporary literature.